the people, teams, and resources needed for different areas of construction. 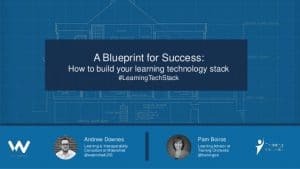 Join Pam Boiros from Training Orchestra and Andrew Downes from Watershed as they explain how to build or restructure your learning tech stack foundation from start to finish and beyond. Watch the webinar below! ROI Calculator: Interactive online calculator tool that will generate a free report for you, identifying areas for optimization in instructor-led training. Checklist for L&D Training Management – A checklist to help you assess the structure and needs of learning technologies currently in place in your organization. Essentials LRS – An LRS with basic reporting capability intended to help you lay the foundation on the path toward more robust learning and training analysis. Program Measurement Guidebook – A workbook to help you can envision your first (or next) xAPI-enabled learning measurement strategy. 1. I am very surprised that the analysts do not talk about the “training resource management system,” while in our organization we do 70% of ILT (and growing) and manage our resources and budgets with XLS spreadsheets (and a box of Kleenex). Do you know why analysts do not talk about this foundational technology? Pam: Analysts are just starting to cover and talk about TRMS. One of the reasons is the prevailing thinking has been that ILT is “going away” and is being replaced by e-learning. But, as your organization demonstrates, many, many organizations still conduct the majority of their training via ILT. You can find out more on our blog post, The Death of Instructor-Led Training Has Been Greatly Exaggerated. 2. Totally agree. You’d be shocked at some very progressive companies still using Excel for this! Andrew: Yes, several Watershed clients have moved to Watershed having previously generated reports in Excel. Excel isn’t designed for this kind of complex reporting. As a result, the reports are often very time consuming to create, are only up to date at the point in time they are created, and can often contain inaccurate data. See Watershed’s blog post, 5 Pitfalls of Using Excel to Report on Learning, for more details. Pam: Same for Training Orchestra. The number of large, Fortune 500 companies using spreadsheets and manual documents to manage their training logistics is mind boggling. As they get exposed to the power of a TRMS, they realize that manual administration isn’t the only way. Some of the reactions we get include, “Where have you been all my life?”. 3. Is anyone actually using an LCMS? Andrew: Yes! I don’t think the term would exist if people weren’t using them. The line between LMSs, LCMSs, and cloud-based authoring tools is definitely a bit blurry though; some products might put themselves in multiple categories, while two products you think are similar might put themselves in different categories. Elucidat recently published a blog comparing LMSs and LCMSs that might help people interested in finding out more about this topic. 4. You mentioned earlier millennial preference for ILT. From what research did you learn this? Pam: I was referring to a study by Wainhouse Research. This research was done in conjunction with D2L, one of the major LMSs. Some of the key findings were published in a press release from Feb 2018. Some additional details from the study were included in another short article via HR Dive. 5. Do you expect to see more adoption of xAPI? Andrew: Yes. We’re already seeing a lot of adoption of xAPI—especially in the U.S., and our recent xAPI xAPRIL webinar series showcased five organizations with enterprise deployments of xAPI in their organizations. Many of their organizations started their projects with us one to two years ago, which is when we started to see a real shift with more companies moving beyond pilots and experiences to real implementations. 6. What needs typically drive a company to look at a learning tech stack approach? Is it the limitation of the LMS, demand from key stakeholders, or learners that you can’t meet? Or something else? Andrew: On the webinar, I shared the Visa case study. In their example, they already had a lot of learning technology products and resources they wanted to bring together into a joined ecosystem. In other cases, we might see organizations that want to move into empowering more informal self-directed learning, or we see organizations that need to replace old LMSs and want to move to a modern learning ecosystem approach. 7. How do I involve my vendor partners, and how early in the planning process? How will they help my planning? Is it possible that two or more of my vendors will collaborate with each other on my behalf? Andrew: We love to get involved as early as possible and work with other vendors on integrations. As part of an implementation (and often even before we have a specific client to work for), we’ll lend our xAPI expertise to help them implement xAPI and improve existing implementations. We’re also very happy to work with prospective clients on developing a learning measurement strategy, which is a vital first step before fully deploying the technology to fulfill that strategy. 8. We’re at the early stages of considering a learning tech stack approach, but I am wondering if this a “one and done” kind of thing? Or, can I start small and integrate more technologies or functionality later? Andrew: You should definitely start small and build. This is such a vital message as a lot of organizations can be put off by the enormity of the task and never get started. So just start somewhere. In relation to learning analytics we often hear organizations say something like “if we had just started collecting learning data 4 years ago when we first talked about this, we’d now have 4 years worth of data to build on. Our xAPI xApril case studies include a few organizations who have started small and built up. Pam: Totally agree. Starting small makes sense, and remember, be sure to start with a solid foundation. Most organizations will not be building a learning tech stack from scratch—they’ll be augmenting existing technologies already in place, making them work together, and then adding other technologies as the need arises. I am reminded of the famous quote from Arthur Ashe: To achieve greatness, start where you are, use what you have, do what you can. This is certainly true about building and optimizing a learning tech stack! 9. One problem at a very large Fortune 500 company I work with is, since they use CSoD for hiring, payroll and training, we, as instructional designers, are not allowed into the system to view any data, not even the results of training. Hopefully this sort of a tech stack avoids that issue. Andrew: Yes, definitely. A Learning Analytics Platform can pull in just the relevant data and provide a window to the data for the L&D team and for operational managers from a learning and performance perspective. Learning Analytics Platforms may also have features to control data permissions (Watershed does) to ensure that people only see the data they are allowed to see. 10. What is the high-level pricing model? Pam: Pricing for Training Orchestra is based on a number of factors including the number of sessions, the number of administrators, and the how much of the full feature set you require. It’s a SaaS software license model with a monthly fee, along with some upfront implementation efforts/costs. Training Orchestra pricing and package information is available here. Andrew: We offer pricing tiers based on functionality. You can learn more here.